Simon & Schuster, 9781982103224, 2624pp. 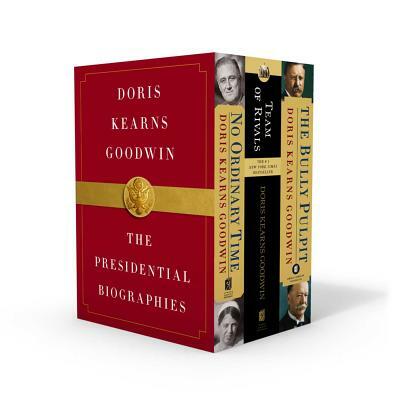 Winner of the Pulitzer Prize for History, No Ordinary Time relates the story of how Franklin D. Roosevelt, surrounded by a small circle of intimates, led the nation to victory in World War II and with Eleanor’s essential help, changed the fabric of American society. The landmark biography of Abraham Lincoln, adapted by Steven Spielberg into the Academy Award-winning film Lincoln, and winner of the prestigious Lincoln Prize, illuminates Lincoln’s political genius as he brought disgruntled opponents together and marshaled their talents to the task of preserving the Union. The prize-winning biography of Theodore Roosevelt—a dynamic history of the first decade of the Progressive era when the nation was coming unseamed and reform was in the air. Told through the friendship of Roosevelt and William Howard Taft, Goodwin captures an epic moment in history.